Two University of Cincinnati police officers who verified former officer Ray Tensing’s accounts of the shooting death of Black motorist Samuel DuBose, Eric Weibel and Phillip Kidd, were also involved in the death of Kelly Brinson, another unarmed Black man, five years ago. Those officers escorted Mr. Brinson to a seclusion room, placed him in restraints, and in the presence of medical staff, tased Mr. Brinson three times. Mr. Brinson suffered extreme pain and experienced respiratory and cardiac arrest. He died three days later. Mr. Brinson was not a criminal. He was a civilian hospital patient He was herded and then electrically prodded like an animal rather than treated like a human being in need of medical care. Brinson’s family settled a federal civil court case for $638,000. 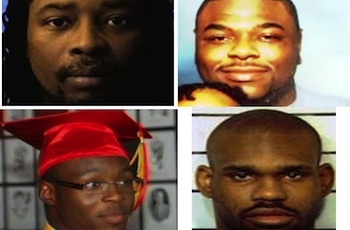 Two other Black men were also killed by University of Cincinnati police officers: Everette Howard, an 18-year-old preparing to attend the University of the Cumberlands in Williamsburg, Ky., died when an officer fired a Taser at him in 2011; andLorenzo Collins, 25, who in 1997 was placed on mental hold at the University Hospital and subsequently shot by two officers after fleeing the hospital and reportedly threatening to throw a brick; he did not have a firearm. Tensing’s body cam captured the alleged murder of DuBose. The encounter described in the police report, written by Weibel, conflicts with the video. When Hamilton County, Ohio, Prosecutor Joe Deters announced Wednesday that Tensing was indicted on murder charges, he said Tensing was not dragged and that he fell back after shooting DuBose in the head. However, Kidd and another UC officer, David Lindenschmidt, were on the scene, and Kidd said the car dragged Tensing. After their body cam videos were released on Thursday, which shows both were behind Tensing at the time of the shooting, the officers were put on paid leave and an internal investigation began. “Did you see him being dragged” the officer asks. It was announced Friday a grand jury declined to indict Kidd and Lindenschmidt. They will not face criminal charges. “When the officers were specifically asked about what they saw and heard, their statements matched Tensing’s body camera video,” Deters said. The officers will remain on leave until an internal investigation of the shooting is complete. There is no evidence on any of the three body cams that Tensing was dragged. Tensing pleaded not guilty to charges of murder and voluntary manslaughter at a court arraignment on Thursday. Judge Megan Shanahan set the bond at $1 million. The Hamilton County Clerk of Courts’ website indicates Tensing posted bond. Aug. 19 is his next scheduled court date. People who watch an encounter on video using the slow motion setting to determine what happened have a luxury that police on the street don’t. We make split second decisions. Some are right, some are wrong. But all of our decisions are made with an eye toward protecting the public and ourselves. The union says the university did not abide by its three-yearcontractand fired him without due process.Fehr said that Tensing was notified of the union’s actions, and he agrees. “The university stands by its decision to terminate Officer Ray Tensing,”university spokeswoman Michele Ralston said Friday.